You’re invited to dine with us at a cozy Aspen retreat where we’re serving up a comfort food menu inspired by Aspen staple, Jimmy’s. This time of year, there are two schools of thought. One that believes the only way to battle the colder weather is to escape to tropical climates. And the other, which I belong to, that believes if you can’t beat the weather, might as well put it to good use. 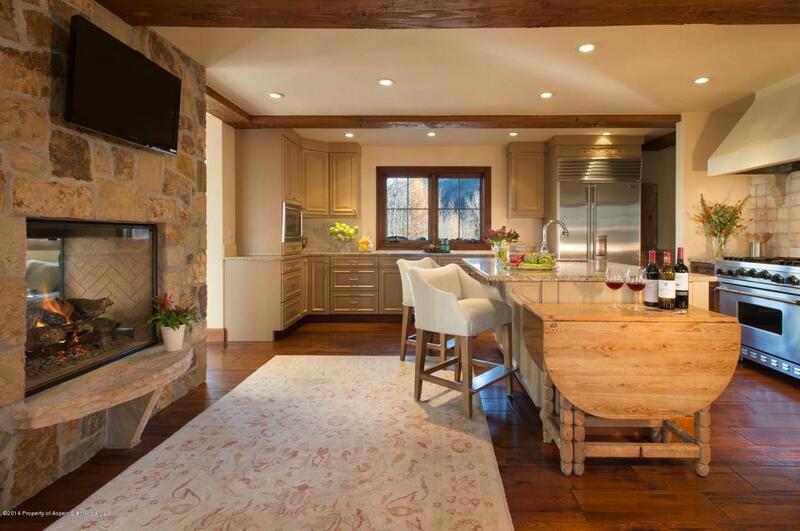 In this month’s installment of Home Cooked Recipes, we invite you to dine with us at snowy 15 Westview Drive in Aspen, Colorado, where we’re whipping up a comfort classic to enjoy after a full day of skiing on some of the country’s best slopes. Our hearty après-ski menu will be served cozy-style in front of the kitchen’s two-way fireplace. 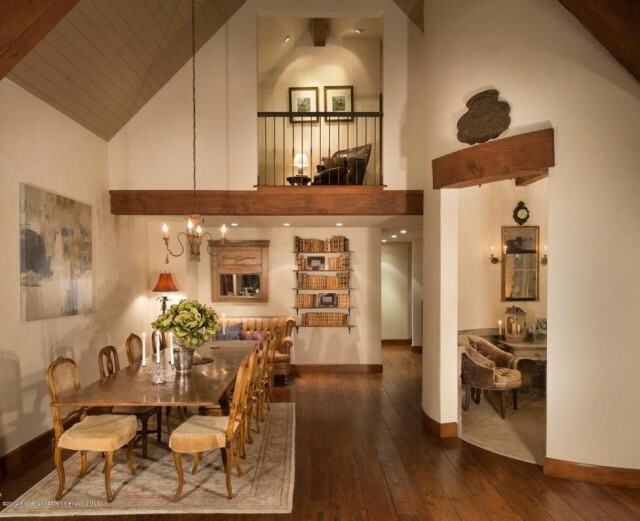 Though, the elegant dining space with rustic wooden accents would be perfect for a larger dinner party. In fact, the home is ideal for entertaining, as the floor plan has an effortless flow from the family room, kitchen, dining, and outdoor living spaces. 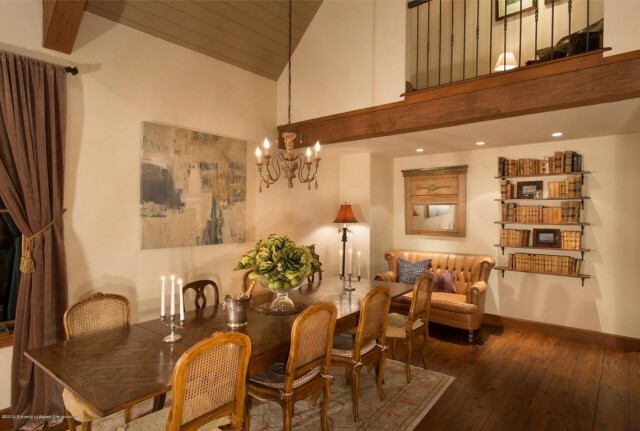 Within close proximity to downtown Aspen, this 5,400 sq. ft. mountain cottage is the perfect family retreat. While Aspen is certainly not short on gourmet dining options, one of the most famed food spots in the resort town is one known for it’s more casual home cooking: Jimmy’s. 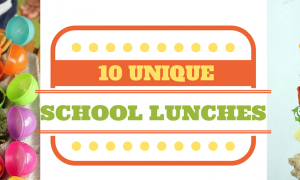 Inspired by the comfort food menu of this Aspen staple, (Did you know Aspen has a Mac & Cheese Festival?!) we’re serving Jimmy’s Aspen Style Mac & Cheese. Drizzle oil into a large pot of boiling salted water. Add the macaroni and cook according to package directions. Drain well. Meanwhile, heat the milk in a small saucepan, being careful not to boil it. Melt the butter in a large (4-quart) pot and add the flour. Whisk over low heat for 2 minutes, stirring constantly to cook out the raw flour taste. While whisking, add the hot milk and bring to a boil, cooking until thickened and smooth. Off the heat, add the Gruyere, cheddar, salt, pepper, and nutmeg. Stir in the jalapeño and bacon and fold in the cooked macaroni. Pour into a 3-quart baking dish. Top with panko bread crumbs. Bake for 40 to 45 minutes, or until the sauce is bubbly and the macaroni is evenly browned on the top. Thank you for joining us this month for another delicious meal. See you in January at a warmer destination, we promise! 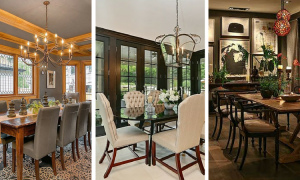 These delicious dining rooms from Coldwell Banker listings would be the perfect setting for a Thanksgiving meal.